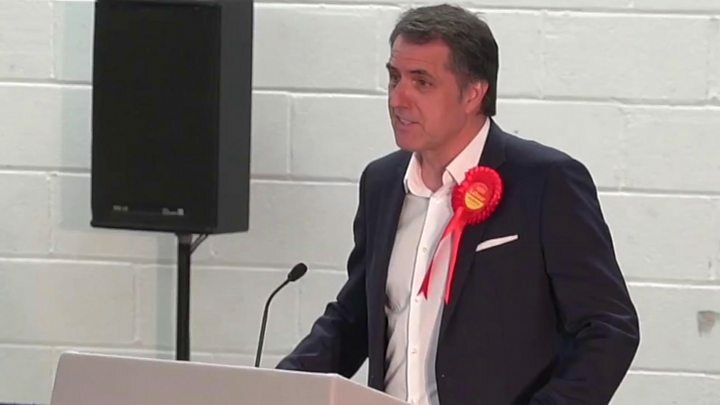 Labour's Steve Rotheram has been elected as the first "metro mayor" of the Liverpool City Region. The 55-year-old was backed by voters in the Merseyside boroughs of Liverpool, Knowsley, Sefton, St Helens and Wirral, as well as Halton in Cheshire. The city's former Lord Mayor was elected with 59% of the vote. Conservative candidate Tony Caldeira came second with 20%. Mr Rotheram will now lead the region's combined authority. He has worked as parliamentary private secretary to Labour leader Jeremy Corbyn, and served as MP for Liverpool Walton before Parliament was dissolved earlier this week. Mr Rotheram has not yet decided whether to seek re-election to the Commons, the BBC understands. Fewer than a third of registered voters used their ballot in the Liverpool City Region election, with turnout at 26%. Only 21% voted in Halton, while in Liverpool 29% exercised their democratic right. Mr Rotheram said his election was an "early warning shot across the Tory bows" before next month's general election. The win was "the best platform we can have to demonstrate that Labour in power can be trusted," he said. He said it was time for the region to "punch above its weight" and he would "work to address the north-south divide by raising aspirations for all". Liverpool City Region has "spoken loud and clear in favour of a Labour metro mayor... a bold manifesto, a Labour vision and a fresh start" and "together we can seize devolution for the golden opportunity it presents," he said. Labour leader Jeremy Corbyn tweeted his congratulations, saying Mr Rotheram is "a person of great integrity, who will stand up for the people of Liverpool". Celebrating in Liverpool with Mr Rotheram, he praised those who have campaigned for Labour. Referring to the city's two Premier League football teams, he said: "I know there are two teams in Liverpool, but today there's just one". The Knowsley-born city region mayor elect was born into a Labour family with his father, a forklift truck driver, serving as a councillor in Kirkby in the 1970s. He became a bricklayer after leaving school and set up his own company by the age of 22. He was elected to Liverpool City Council in 2002 and was Lord Mayor during the city's year as European Capital of Culture in 2008-09. Mr Rotheram was elected MP for Walton in 2010 with a 58% majority, increasing this to 72% in 2015 to make it Labour's safest seat.